With a dovish statement and a forecast for no additional rate hikes this year, the Fed sent a clear signal in March that it is watching both data and markets, preferring to err on the side of caution as mixed messages abound. With this stance, we are back to the future, with every major central bank effectively easing policy in word, deed or both. A slight pullback in March evokes an important lesson learned last year: Diversification works. After rebounding significantly this year, global risk assets have spent the past month fluctuating between monthly gains and losses, while global bond yields have fallen. The main culprit, once again, is the fear of slowing global growth. We have seen the market pendulum swing multiple times in relatively short order. Equity markets rallied in 2017, anticipating better earnings and economic growth in 2018; dropped sharply in late 2018 as signs of a global economic slowdown increased; and rebounded significantly in January and February under the premise that predictions for US recession were greatly exaggerated. While investors experienced the pain of a difficult fourth quarter in 2018 quickly followed by the euphoria of a “v-shaped” recovery in risk assets in early 2019, a foundational investment concept was reinforced: True diversification is important, and it works. Risk control assets had a negative correlation to risk assets during the sell-off in late 2018.1 We look at the balance of risk control assets against risk assets, which tend to correlate strongly to one another during periods of market stress. It is this balance that defines your level of true diversification and can provide a buttress against risk asset drawdowns. While we remain constructive on risk assets in 2019, returns will likely be coupled with more normal levels of market volatility. Striking the right diversification balance will be the key to success. Global Growth: Slowing, Not Stalling. Investors are not the only ones noticing slower growth. The Fed reduced its growth forecast in March, lowering its expectation for 2019 US GDP to 2.1%, with the assumptions that unemployment will remain low and inflation benign. Federal Reserve Chairman Jerome Powell also gave air time to the risks abroad, recognizing that the global ecosystem is interconnected, complex and, given economic slowdowns in both Europe and China, increasingly fragile. The combination of weakening global growth and the diminished impact of the 2018 tax cuts have muddied the US outlook, and data has been a mixed bag. For example, recent retail sales, Philly Fed Index and non-farm payroll reports have been weak, whereas ISM services data and consumer confidence have shown strength. But the Fed’s caution seems warranted as we look toward 2020. We do not have a recession in our forecast but acknowledge that risks have risen, particularly prior to the more accommodative stance the Fed adopted this year. The Fed is late to throw in the towel. Despite its strong belief last year that “normalization” of both rates and its balance sheet were required, the Fed has reversed course on both. 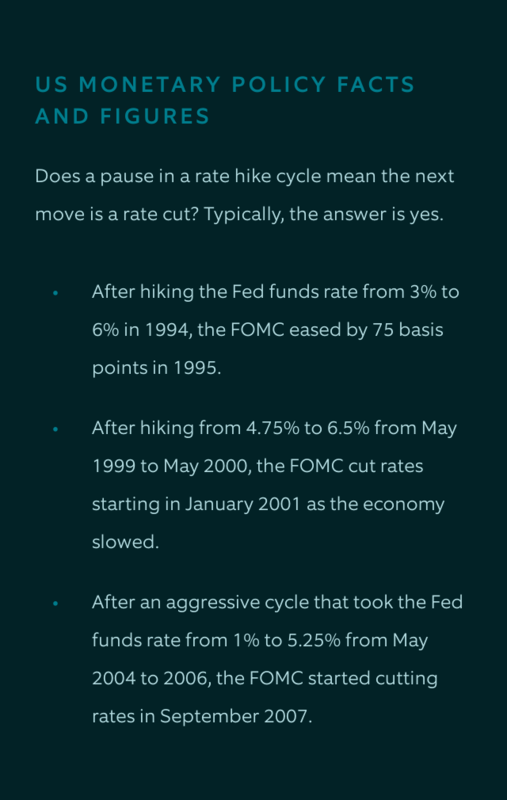 With respect to rates, this hiking cycle, which began in 2015, could end here, with the target Fed funds rate at 2.25-2.50%, leaving what most would suggest is a paltry amount of interest rate firepower for the next recession. At the same time, the FOMC announced that the reduction of its balance sheet will taper starting in May and ending in September. As a de-facto tightening of policy, the end of the balance sheet reduction is an important reinforcement of the Fed’s new dovish stance. In terms of monetary ammunition in the event of the next recession, we don’t doubt the Fed’s ability to get creative, consider negative interest rates, and resume quantitative easing should the economy falter. The issue currently, however, is that the Fed is reacting and potentially behind the curve. And with the yield curve having briefly inverted in late March, the bond market is sending a strong signal: The FOMC went too far with the December rate hike and should consider a cut soon. Fundamentals matter and are supportive. But at current valuations, investors will continue to be on high alert. The outlook for risk assets looks fairly good, assuming slower-but-resilient global growth, subdued inflation and accommodative central banks. Analysts are projecting solid, mid-single-digit US earnings and revenue growth3 for the year, and credit fundamentals, including low default rates, remain relatively healthy. The outlook for developed ex-US and emerging market earnings is similarly solid. For the US market, the rub is valuations. 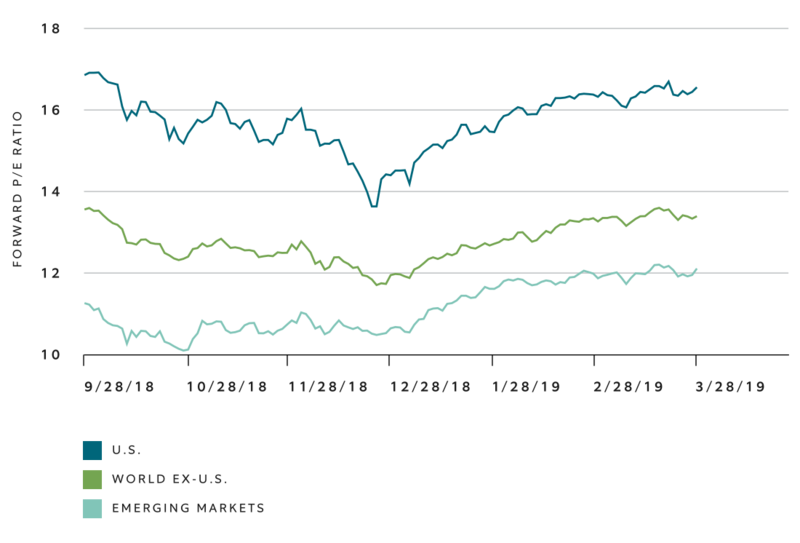 After bottoming out in December 2018, equity valuations have recovered meaningfully, particularly in the US, where the S&P 500 stands roughly in line with historical averages. This means further appreciation will increasingly hinge on evidence of economic and earnings resilience. Equity valuations have quickly returned to pre-correction levels. Slowing global growth and headlines about high valuations have some investors second-guessing their commitment to private equity. Fundraising has indeed been prolific, with non-traditional investors, such as hedge funds and even mutual funds, driving valuations up, particularly in larger venture capital and leveraged buyout deals. Plus, companies are staying private longer, receiving successive rounds of financing at valuations closer and closer to public markets, further contributing to this trend. Although currently compressed, the enhanced return potential offered by the asset class remains alive and well and has been consistently demonstrated over time. At Northern Trust, we categorize assets into two “super” asset classes – what we call the risk control and risk asset portfolios – as the foundation for our asset allocation methodology. Risk control assets include cash, investment-grade taxable and tax-exempt bonds, and inflation-protected bonds. Risk assets include high-yield bonds, developed global equity, emerging markets equity, natural resources, real estate and infrastructure, private equity and hedge funds. For more information about our investment philosophy and goals-based asset allocation process, see Protect Your Goals in Volatile Markets. Bloomberg. All returns shown as total return on a US dollar basis. FactSet Earnings Insight_March 22, 2019. 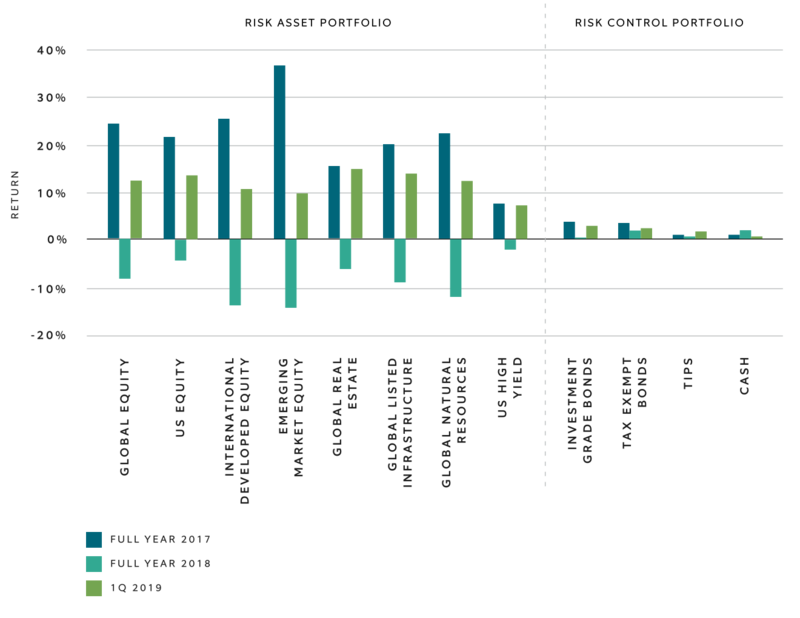 Northern Trust Investment Strategy, Bloomberg. S&P 500 data represents U.S. data while MSCI represents world ex-U.S. and emerging market data. Data from September 30, 2018 through March 29, 2019. The information contained herein is for informational and educational purposes only. Past performance is not indicative of or a guarantee of future results, which will fluctuate as market and economic conditions change. 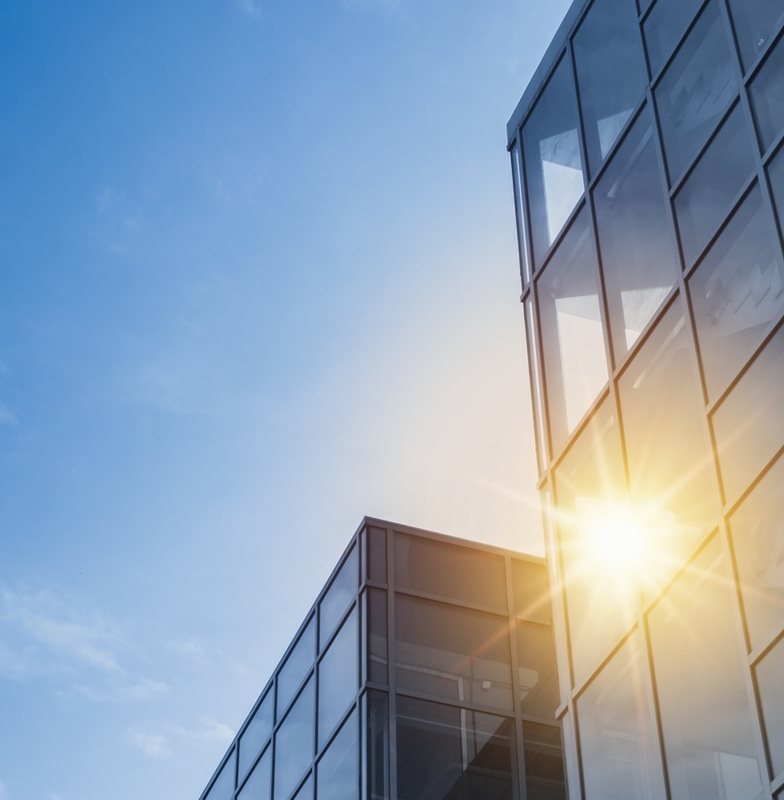 Private assets are illiquid and are not suitable for all investors, and transferability may be limited or even prohibited. 50 South Capital/Northern Trust Research. The index is a horizon calculation based on data compiled from 4,863 funds: 1,807 US venture capital funds, including fully liquidated partnerships, formed between 1981 and 2018, and 1,481 US private equity funds (buyout, growth equity, private equity energy and subordinated capital funds) and 1,575 Ex US private equity and venture capital funds, including fully liquidated partnerships, formed between 1986 and 2018. Private Equity indexes are pooled horizon internal rate of return (IRR) calculations, net of fees, expenses, and carried interest. Data as of 6/30/18. Sources: Cambridge Associates LLC, Barclays, Dow Jones Indexes, Frank Russell Company, MSCI Inc., Standard & Poor's and Thomson Reuters Datastream. MSCI data provided "as is" without any express or implied warranties. * Capital change only. Notes: Total returns for MSCI Emerging Markets indices are gross of dividend taxes. Total returns for MSCI Developed Markets indices are net of dividend taxes. Data as of 6/30/18. Past performance is not indicative or a guarantee of future results. The information contained herein, including any information regarding specific investment products or strategies, is provided for informational and/or illustrative purposes only, and is not intended to be and should not be construed as an offer, solicitation or recommendation with respect to any investment transaction, product or strategy. Past performance is no guarantee of future results. All material has been obtained from sources believed to be reliable, but its accuracy, completeness and interpretation cannot be guaranteed.